Established in 2003, the Fasteners business vertical has integrated advanced and state-of-the-art manufacturing facilities at MIDC, Tarapur in Maharashtra. We are amongst the most modern and one of the largest manufacturers of HT Fasteners in the country. 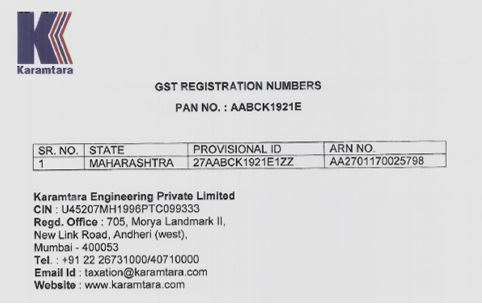 Karamtara Fasteners offers a total systems approach to fastening solutions to the customers' requirements. We manufacture bolts, nuts, anti-theft bolts & nuts, studs, foundation bolts, U-bolts, plain and spring washers. Our manufacturing facility in Tarapur has installed capacity of 30000 MT per annum. This plant manufactures HT & MS fasteners for Power Generation, Transmission & Distribution Industry, Telecom Tower Industry, Automobile Industry etc. The manufacturing facility has both Hot Forging and Cold forging facilities. It is certified with ISO 9001:2008, ISO 14001:2004 and OHSAS 18001:2007 standards. We source raw materials from Tata Steel, JSPL, RINL, Usha Martin, Dhamm Steel, Mukund Steel etc. Our product range covers all types of fasteners such as bolts, nuts, studs etc. conforming to national and international standards such as IS, ISO, BS, DIN, ASTM & ANSI etc. Our products are widely used in Transmission Line Towers, Railways, Telecom, Electricity Depts., Road crash barrier manufacturers, Oil field services etc.